This article explains how to connect to Microsoft SQL Server using unixODBC + FreeTDS. It includes installation and configuration instructions for Ubuntu and CentOS. Note: FreeTDS utilizes unixODBCs driver manager, among other things. Note: .freetds.conf is not required if you are using only ODBC, .freetds.conf is only required if using FreeTDSs versions of DB/CT-library. 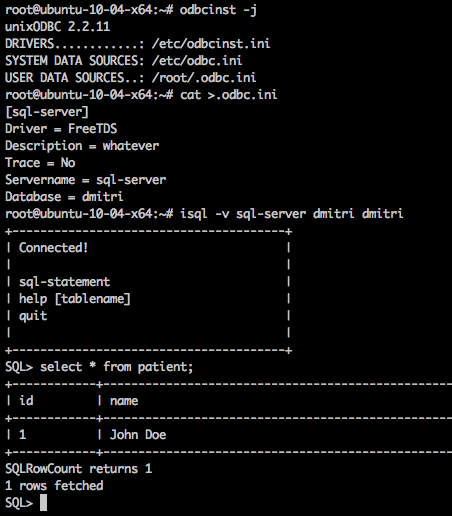 This means you can configure using only odbc.ini, optionally using odbcinst.ini. ODBC is a standard. It defines APIs for accessing database management systems. DMBS independence is achieved by using ODBC drivers as a translation layer between the application and the database. Database drivers, like device drivers, are software which encapsulate logic and provide standard APIs, allowing higher-level layers to access lower-level functions in a generalized manner. A driver allows ODBC compliant applications to use a datasource. A datasource name, or DSN, is how identifiers in code are mapped to actual parameters required to make a real connection. A DSN identifies a particular connection. ODBC also provides a Driver Manager. The driver manager knows about configured drivers and DSNs. The driver manager enables run-time lookup of DSNs. This is very useful. Some parameters can even be supplied at run-time, e.g., passwords. TDS is a protocol. It stands for Tabular Data Stream. Protocols allow two computers to communicate and describe how this should happen at the bit level. It allows data to be sent across networks as a stream of bytes. The DB and CT libraries provided by Sybase and Microsoft provide proprietary, application level libraries to transfer data between the database server and the client. These libraries can translate the TDS protocol. There is also an ODBC library that is able to perform this task. FreeTDS an open source implementation equivalent of these libraries. We are only interested in ODBC. All that is required is to configure the odbc.ini file. Note: freetds.conf is not required. Note: The <comments> in angle brackets should not be included. Incorrect port number: SQL Server defaults to port 1433, but a different port can be used. Speak to your database administrator (DBA) or network administrator. Using integrated security: Kerberos is needed on Linux, this SQL Server page Using Integrated Authentication has some information. 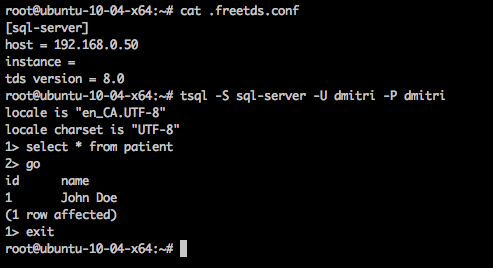 Iguana has been verified to work with SQL Server from Linux, via unixODBC + FreeTDS driver. This example demonstrates setting it up using Ubuntu 10.04 x64 (where required FreeTDS packages are available from the package system). Adjust accordingly if you have a different type of system. Using local configuration variant (this is also cleaner from system administration perspective, as the entire configuration can be contained in a non-privileged user account). Iguana looks for libodbc.so – default installs of unixODBC don’t always provide this exact name (often only as libodbc.so.1). 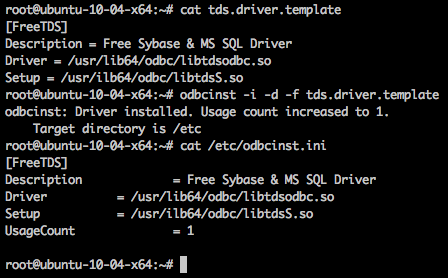 Next, configure the unixODBC Driver – it can be done from a template using odbcinst, or manually. Create a data source configuration – odbcinst -j can be used to display where unixODBC looks for configuration files. Again, as you can see, this can be done locally under the current user, or globally in /etc. Create a configuration file, adjusting to your own Servername and Database. Now, assuming everything is configured correctly, you should be able to connect to the database from Iguana. 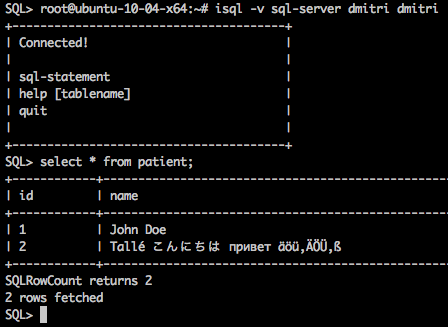 “Export Tables” screen on a legacy Database channel can be used as a quick test to verify the ability to work with a given database (WITHOUT executing them). If you see SQL statements in Preview, that means Iguana is able to connect to the database. Now we’re ready to try out in Translator. 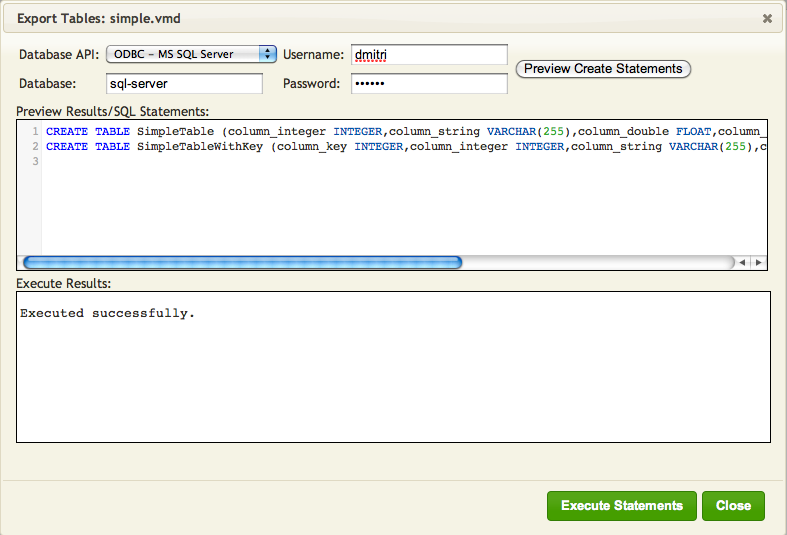 If you try simply working with the database, you may find that it fails with a mysterious error message. For bonus points, verify that Unicode characters are handled properly.